A press release reminded us that 2017 was designated by the United Nations as the “International Year of Sustainable Tourism Development.” The UN World Tourism Organization has had a full calendar of events and conferences promoting the concepts and importance of sustainability. What we hadn’t noticed was that giving a helping hand to the effort was none other than Hello Kitty, a fictional character the UNWTO named Special Ambassador of the International Year, through a deal with Hello Kitty’s producer Sanrio. 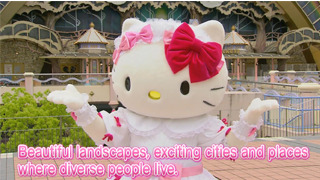 “Travelling opens our minds and our hearts, and lets us see how we are equal,” the Hello Kitty character squeaks in a video launching the campaign. After reading the press release and watching (part of) the video, we realized that while Hello Kitty is a familiar icon, we really didn’t know much about her. According to Wikipedia, Hello Kitty is “a female anthropomorphic white Japanese Bobtail cat with a red bow and, notably, no mouth.” Created in 1974, the long-lived Kitty is now 43. And she’s in the height of her earning power – by 2014, when Hello Kitty turned 40, she was estimated to be earning about $7 billion a year. The video is being shown at Japan’s Narita airport and can be viewed on the website and social media channels of the International Year.